vera-wang-wedding-gown-lace-green-ribbon, originally uploaded by savannahbrewer. 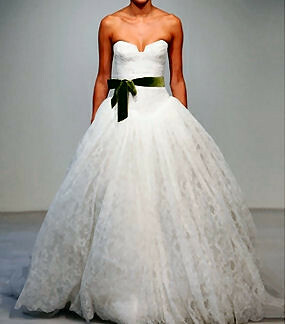 beautiful strapless Vera Wang lacy wedding dress with green bow. A new style for the modern bride who wants a little more romance in her wedding. Hello! I've been trying to find this dress everywhere online but I haven't had any luck. Could you please help out posting a link please? Any ideas on how to get it or find it please! I know! I have been looking for it to! Im starting to think the dress doesn't exist! Can anyone help? ?